Welcome Slough Boatworks (WSB) is located on Puget Island which is 25 miles up the Columbia River from Astoria, Oregon. Welcome Slough is a tidewater slough on the south side of the island itself. Years ago, the Blix family built the majority of the early 1900 gillnet boats for the Lower Columbia River commercial salmon fishery, right here on Welcome Slough. This vessel is 16-foot Glen-L plan Garvey Jimbo. Made to retrieve salvage drift logs from the Columbia River. The changes from the plan are a double transom for strength and built without center console. 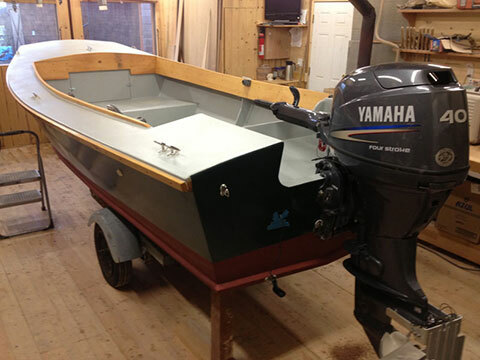 WSB is a small boat workshop that specializes in modern and conventional construction from boats that are 8 to 21 feet in length. With access to high density, hydro-tech marine plywood that is 1088 British Standard, as well as custom milled fir, cedar and ash that are all locally grown, WSB can turn out high quality boats with traditional craftsmanship.